As with most things mechanical, despite the 1911's sterling reputation, down through the years there have been those who have tried to "improve" it even more. Case in point: In 1992 Virgil Tripp and Sandy Strayer formed a company named STI International to market a high-capacity 1911 pistol that used a modular frame made from fiber-reinforced plastic. This plastic portion combined the trigger guard, grip and integral magazine well, and it was attached to the upper portion of the frameâ€”a metal part that comprised the dust cover and frame rails. Known as the 2011, this frame weighed less than half of a steel frame and was narrower than other high-capacity 1911s, making it easier for persons with smaller hands to shoot. Today STI's 2011 pistols dominate USPSA/IPSC's Open and Limited divisions. Located in Georgetown, Texas, STI offers one of the most complete lines of 1911 pistols. A quick perusal of its website shows pistols suitable for military/police service, concealed carry, personal defense, hunting and competitive shooting. In addition to its stock models, the company will also build a pistol to a customer's specifications. While best known for the 2011, it offers a series of full-size, compact and sub-compact metal-frame 1911s for more traditionally minded buyers. The gun that most interested me was the company's new Nitro 10. As you probably guessed, the Nitro 10 is chambered for the 10mm Auto cartridge. The cartridge's story begins in the late 1970s when U.S. police forces were switching en masse from the traditional .38/.357 revolver to the new breed of 9mm semiauto pistols. This change was accompanied by much acrimonious debate between partisans of the 9mm Luger and the "bigger bullets are better bullets" crowd. Against this backdrop, a gentleman by the name of Whit Collins determined that what was needed was a cartridge with a flatter trajectory and greater range than the .45 ACP but with more stopping power than the 9mm Luger. He envisioned a cartridge that propelled a 200-grain bullet to about 1,000 fps, which provided the desired ballistics and had the added advantage of permitting more rounds to be loaded in the pistol's magazine. Collins approached Col. Jeff Cooper, who lent his support to the idea and worked on the design with other developersâ€”eventually resulting in the Bren Ten and a cartridge dubbed the 10mm Auto. However, the resulting cartridgeâ€”initially loaded by Normaâ€”was hotter than what Cooper had envisioned. The first loads included a 170-grain jacketed hollowpoint at 1,300 fps and a 200-grain full metal jacket at 1,200, and even today some commercial loadings produce levels of energy that approach those of the .41 Magnum. Over the years a number of companies have produced pistols chambered for the 10mm. The FBI adopted it for a short time, and some U.S. police departments use 10mm pistols. The government of Denmark issues them to personnel of the Sirius Sledge Patrol in northeast Greenland for defense against polar bears the unit encounters during its patrols. STI introduced its first 10mm pistol, the Perfect 10, in 2009. Built on the 2011 modular frame, it was a long-slide design with a six-inch barrel and a high-capacity (14+1), double-column magazine. Originally designed for tactical units that desired a pistol with more authority than a .45, it also found favor with handgun hunters and wilderness guides for protection against bears. But as STI's Rabbit Boyette explained to me, while the Perfect 10 attracted a fair amount of interest, there were a number of less than positive comments with regard to its length and weight compared to a traditional 1911. It didn't take STI long to realize that when "traditional" and "1911" are mentioned in the same sentence it can mean only one thing: a Government model with a single-stack magazine. The result is the Nitro 10. With a length of 8.77 inches and an unloaded weight of 38.9 ounces, the Nitro 10 looks and feels like a regular 1911. But upon closer examination it becomes obvious that this is no regular handgun. It goes without saying that a heavy-duty recoil springâ€”in this case 26 poundsâ€”is a necessity in a pistol chambered for the powerful 10mm round. But for most people, a spring that heavy can make retracting the slide a daunting task. That led STI to design a new serration design. The Nitro fore and aft cocking serrations are more like notches that are long and wide with just a few sharply cut ridges; there are two such cuts in the front and three in the back. "We designed the Nitro to have a bold look to match the power of the 10mm," STI Engineering and R&D Manager Chris Schirmer told Handguns. "These serrations do just that, as well as provide ample grip to match the powerful spring." In keeping with its combat heritage, the slide is cut to accept a square, serrated blade front and a non-adjustable Heinie Ledge rear sight. The latter has a generous square notch for fast sight alignment; the ledge is designed so that in case the support hand is occupied or disabled the shooter can retract the slide by catching the sight on a belt, holster or other object and pushing down. A lowered and flared ejection port ensures that spent cases get out of the way reliably. The frame and slide are hand-fitted to close tolerances, and the fitting results in consistent lockup. The pistol has a full-length recoil spring guide rod for smooth functioning. A fully supported, ramped, bushingless, match-grade bull barrel not only provides accuracy but also puts additional weight up front where it does the most good to dampen recoil. Both the slide and the frame are carbon steel and finished in matte blue. The natural handling qualities of the 1911 are improved by removal of metal underneath the trigger guard, allowing a high grip that also helps in recoil control. 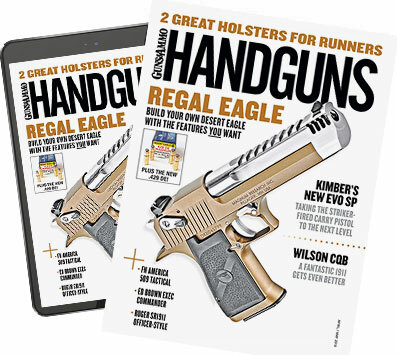 A high-ride beavertail grip safety helps to position the pistol in the shooter's hand securely while distributing recoil for more comfortable shooting, and the edges of the magazine well are beveled for smooth reloads. The frontstrap and mainspring housing don't exhibit the serrations you typically find on a 1911 but rather three vertical cuts. It's a distinctive design, and when you look at the styling cues on the rest of the gun, the cuts fit in with the overall aesthetics a lot better than, say, 30 lpi checkering would have. And as Schirmer pointed out, the three cuts provide good control, especially in combination with the high-rise grip safety and undercut trigger guard that place your hand high on the gun. My testing confirmed that. I received an early production Nitro 10 for testing. Over the years I have tested and competed with a number of STI pistols and have developed a high opinion of them, and the Nitro 10 was not a disappointment. The quality of materials, fit and finish were all first class. The slide goes into battery with a solid "clack," a good indication of its tight tolerances, and the single-action trigger had a short, crisp let-off. According to my RCBS trigger pull scale, it broke at just less than four pounds, which I feel is just right for a pistol intended for combat purposes. To see how STI's new 10mm performed, I gathered a sampling of ammo from Remington, Hornady and Federal and headed to the range. As I touched off the first round, my photographer was taken aback by the recoil and muzzle flash. Even though the pistol's weight helped ameliorate the effects of recoil to a degree, firing 75 rounds of 10mm from a rest over a period of 30 minutes required a fair amount of determinationâ€”if not dogged stubbornness. As I had expected, the Nitro 10 performed very well, producing a series of well-centered groups in the two-inch range, although a few measured nearer to 1.5 inches. Slipping on a Safariland 5198 paddle holster, I then ran the Nitro 10 pistol through several offhand combat drills from seven, 10 and 15 yards. Once again, recoil was, shall we say, impressive, reminding me of hot .357 Magnum loads. But I had no trouble putting rounds where I wanted them, with only a few wandering outside the A and B zones on a pair of USPSA targets. To see how the Nitro 10 performed at longer ranges, I engaged steel plate targets on the 50-yard backstop, firing the pistol both from a rest and offhand. While the majority of the shots fired from the rest produced satisfying clangs, I missed some of the first few from shots offhand. All in all, I liked the pistol. However, while the cocobolo grips were attractive, their smooth surface allowed the pistol to move around in my hands. I think a set of VZ G10 grips would improve handling to a marked degree. We asked STI why it chose those particular grips, and it turns out the cocobolo stocks were the result of a poll STI took of its customersâ€”and a smart outfit always listens to its customers. I also believe that a fiber-optic front sight would be a great aid in fast sight alignment and target acquisition. Other than those two caveats, I feel that those looking for a semiauto pistol that fires a cartridge with magnum-like performance but in a slimmer package than a medium- or large-frame revolver may find that the Nitro 10 is just what they're looking for.